When home laundering cloth diapers, it's very important to select detergents that are free of enzymes, brighteners, dyes, softeners, bleach, and synthetic fragrances. Enzymes can irritate your baby's skin and cause a diaper rash once baby wets the diaper. Brighteners, dyes and fragrances can cause allergic reactions and build-up, which causes cloth diapers to leak or smell like ammonia. Fabric softeners and bleach can cause cloth diapers to break down, wick, repel, and lose absorbency, which shortens the life of the diaper. Not all laundry detergents work the same for everyone, but we found eight great detergents that are free of harmful chemicals, and have been tested for cloth diaper safety. 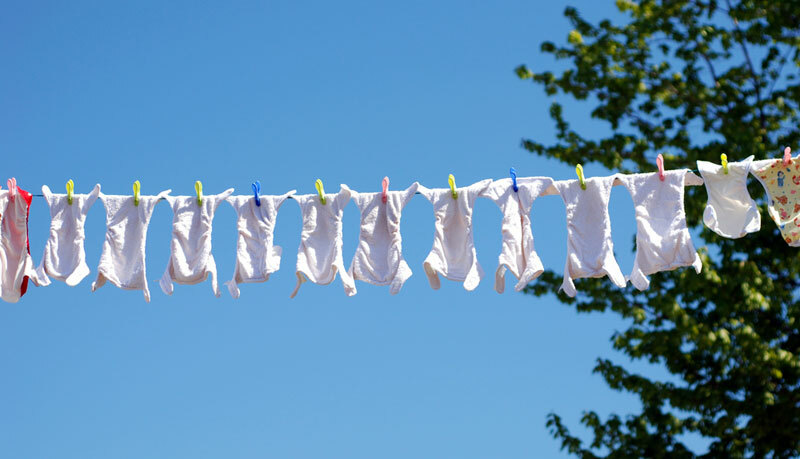 Keep reading to see which detergents are safe to use for laundering your baby's cloth diapers. Charlie Banana just released their non-toxic laundry soap that is safe for your baby’s clothing as well as cloth diapers. The soap is effective on all fabrics including silk, wool, linen, cotton and high-tech microfiber athletic and waterproof gear. Their 2.64 liter container of laundry soap will wash up to 80 loads. 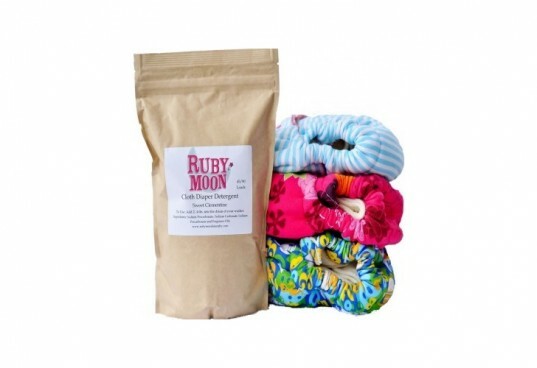 Ruby Moon Cloth Diaper Detergent is available in 5 different varieties including unscented, red apple, lavender, warm vanilla, and sweet clementine. They also have a flavor of the month. Their cloth diaper detergent was created especially for delicate skin and keeping diapers clean. Each bag contains enough cloth diaper detergent for 45 loads of diapers in a top loader and 90 loads in a HE washer. Nellie’s All Natural Laundry Soda is completely biodegradable, non-toxic, mild, hypoallergenic, and fragrance free. The laundry soda is very concentrated, so only 1 tablespoon per load is needed. It is available in 50 or 100 load containers. 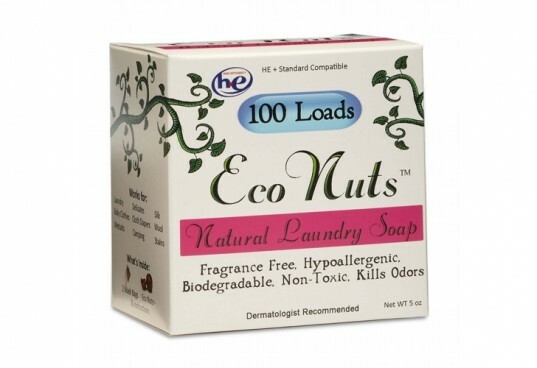 Eco Nuts Soap Nuts are a berry that naturally produces soap called saponin. The saponin in the soap nuts naturally makes cloth diapers softer, fluffier, and more absorbent, while keeping them free of build-up. 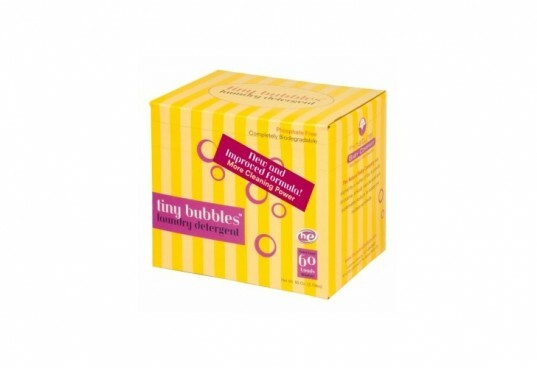 The soap nuts thoroughly wash the diapers and remove any lingering smells. Eco Nuts are available in trial sizes, 100 loads, and 360 loads. Charlie’s Soap is a non-toxic biodegradable soap that gets rid of dirt and odors instead of covering them up. 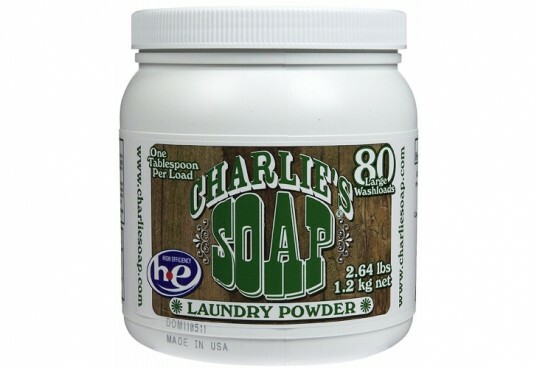 Charlie’s Soap is recommended for cloth diapers, people with sensitive skin and allergies, and children’s clothing. Only 1 tablespoon is needed per load and it is available in 80 or 1000 load containers. 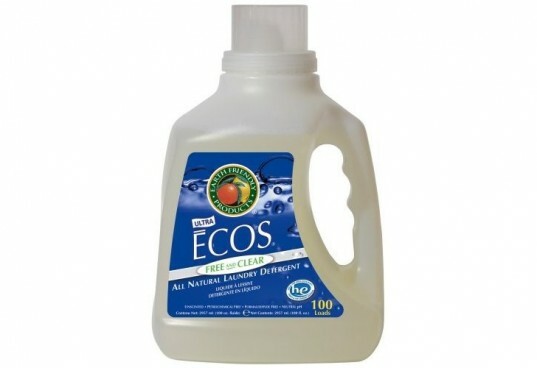 Ecos makes several kinds of laundry detergent, so be sure to get the Free & Clear variety for cloth diapers. Their Free and Clear detergent contains no essential oils, fragrance, coconut based fabric softener, or cellulose optical brighteners. It is available in 50 oz, 100 oz, 5 gallon, and 55 gallon drums. GroVia has designed a cloth diaper detergent that is vegan, not tested on animals, completely biodegradable, gentle for your baby, and EPA Designed for the Environment. The detergent contains natural chelating agents that softens wash water. It is safe for all kinds of cloth diapers. 1 box will wash up to 60 loads. 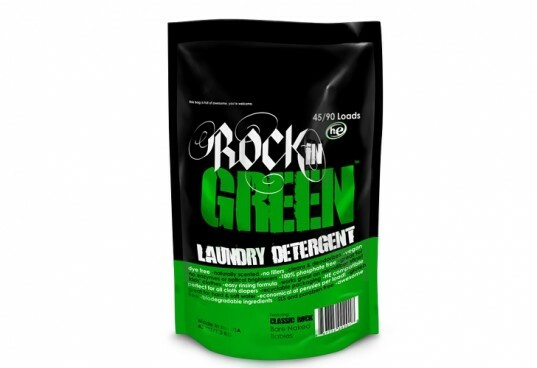 Rockin Green Laundry Detergent is a biodegradable detergent that comes in 3 types of formulas specifically designed for hard, soft, or regular water types. Rockin Green is available in several different all natural scents or unscented. The laundry detergent has a lower PH than most brands, which means it is even more gentle on fabrics and diapers. I have been using Country Save... I buy it online because none of the stores near me carry any CD friendly detergents! My DD's skin is crazy sensitive and Country Save works awesome and is also CD safe AND it's pretty cheap to buy, too. I have a promo code if you are interested in buying at iherb.com. It's PUM485 and it gives you $5 any size order (a box of Country Save is $7.85 or so) or $10 off orders over $40. Rockin' Green soap is my favorite! I started using it for cloth diapers but now I use it for all my laundry. I like that I can chose the formula appropriate for the kind of water that I have and the scents are fantastic, too! 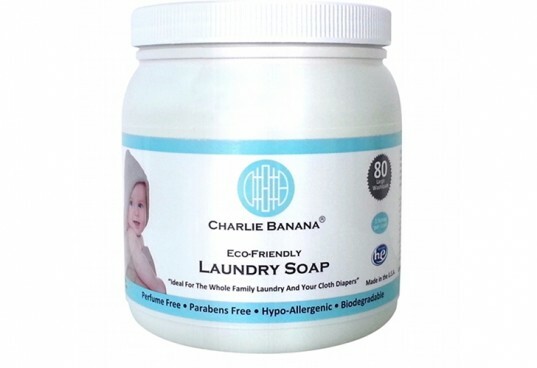 Charlie Banana just released their non-toxic laundry soap that is safe for your baby's clothing as well as cloth diapers. The soap is effective on all fabrics including silk, wool, linen, cotton and high-tech microfiber athletic and waterproof gear. Their 2.64 liter container of laundry soap will wash up to 80 loads. 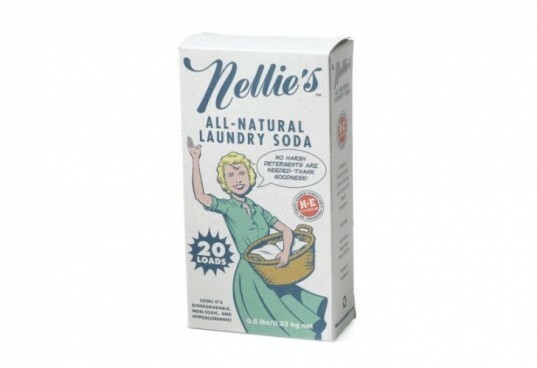 Nellie's All Natural Laundry Soda is completely biodegradable, non-toxic, mild, hypoallergenic, and fragrance free. The laundry soda is very concentrated, so only 1 tablespoon per load is needed. It is available in 50 or 100 load containers. Charlie's Soap is a non-toxic biodegradable soap that gets rid of dirt and odors instead of covering them up. Charlie's Soap is recommended for cloth diapers, people with sensitive skin and allergies, and children's clothing. Only 1 tablespoon is needed per load and it is available in 80 or 1000 load containers.